As the seasons change, so do our appetites and nutritional needs. Between the spring and summer, our food habits undergo a gradual metamorphosis. By the time the hottest months have arrived, most of us are naturally inclined to avoid heavy foods and the long cooking preparations required for them. Leggero (light) or restare leggeri (staying light) is the Italian credo in the summer—fresh, light, colorful and simple foods are what everyone craves on hot days. Italians tend to eat lukewarm or cold food in the summer; tables are often laden with all kinds of variations of salad—from lettuce-based and raw vegetable salads, to insalata di pasta (pasta salads), insalata di riso (rice salads) and insalata di mare or polpo (seafood or octopus salad). 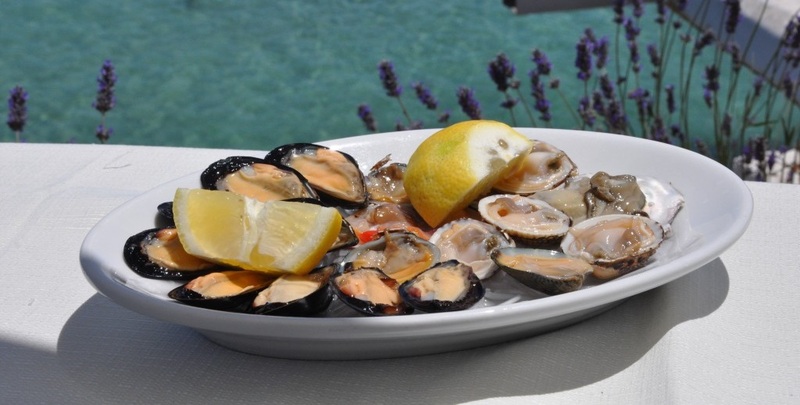 Insalata di mare (Seafood salad) is a delicate preparation usually made with boiled fresh octopus, clams and mussels; the shellfish open when cooked in a covered pan. Sometimes this salad includes shrimp—previously boiled and cleaned—and baby calamari. 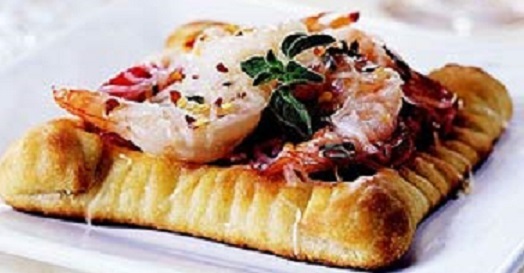 Crabmeat or other fresh seafood can also be added. The freshness of the fish, the quality of the extra virgin olive oil and the addition of good-quality lemon make all the difference. The dressing for this salad is made simply with two essential ingredients of the Italian cuisine—lemon and olive oil, along with a bit of garlic, parsley, salt and white pepper. Insalata di polpo (octopus salad) is another favorite in Italy, especially along the coasts. It consists of just boiled fresh octopus and tiny slices of celery, seasoned with the same dressing as in the seafood salad. Sometimes it’s served cold or at room temperature, but it can also be served warm with potatoes. Trim fennel bulbs, reserving tops. Quarter bulbs lengthwise and slice. Measure 1 cup sliced fennel. Snip enough of the fennel tops to measure 1 tablespoon; set aside. In a large saucepan heat olive oil and cook the 1 cup fennel, the mushrooms, pepper and fennel seed in until tender. Stir in rice. Cook and stir over medium heat for 2 minutes. Add the 1/4 broth and bring to a boil. Gradually add the remaining warm chicken broth, one cup at a time, until all the broth is absorbed, about 20 minutes. Remove saucepan from the heat. Stir in crabmeat and green onions. Let stand, covered, for 5 minutes. Stir in the snipped fennel tops and serve. This dish can also be served at room temperature. Lightly grease a baking sheet; set aside. Unroll the pizza dough onto a lightly floured surface. Roll into a 16 inch rectangle. Cut dough into eight squares. Place squares about 1 inch apart on the prepared baking sheet. If desired, fold over about 1/4 inch of the dough on each edge; press with a fork. Bake in a 425 degrees F oven for 5 minutes or until lightly browned. Divide tomato slices among the squares. Divide shrimp among the squares. Sprinkle with snipped oregano and crushed red pepper. Sprinkle with cheese. Bake for 5 to 6 minutes more or until cheese melts. If desired, garnish with basil. Cut any large scallops in half. In a 4 to 5-quart Dutch Oven, bring 3 quarts of water to boiling. Add pasta; return to boiling. Cook for 5 minutes. Add mushrooms, carrots and green onions. Return to boiling. 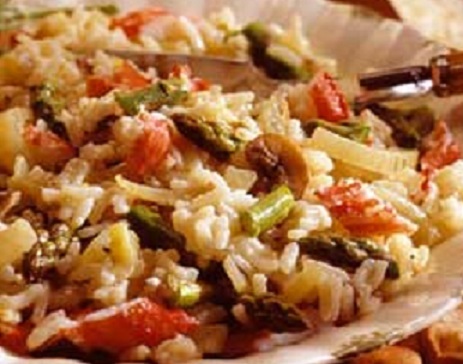 Cook, uncovered, for 5 to 7 minutes more or until pasta is tender but al dente and vegetables are crisp-tender. Drain pasta and vegetables; keep warm. Meanwhile, in a small mixing bowl stir together wine, lemon juice and cornstarch; set aside. In the empty pasta pot melt butter. Add garlic; cook over medium-high heat about 1 minute. Add scallops, wine mixture, lemon zest, Italian seasoning, parsley and pepper to the pan. Cook and stir over medium heat until thickened and bubbly. Cook and stir for 1 to 2 minutes more or until the scallops turn opaque. Arrange pasta mixture on a large platter. Spoon the scallop mixture over the pasta mixture. Makes 4 main-dish servings. 1. Mix all ingredients together in a bowl until butter is blended evenly. 2. Season with salt and pepper. Set aside. 1. Cut 4 sheets of heavy-duty aluminum foil, approximately 14 x 18 inches in size. 2. Place sheet of foil shiny side down, narrow edge toward you, on the work surface. 3. Spray the foil with cooking spray. Arrange 1 fish fillet skin side down, 3 to 4 shrimp, a few scattered cherry tomatoes and scallions on each foil sheet. Season with salt and pepper. Using a teaspoon, place several small dollops of the herb butter on the fish and shrimp. 4. 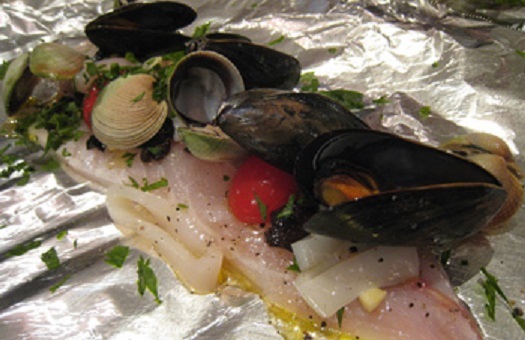 Fold the foil over the seafood and bring the top and bottom edges together. Fold the edges over several times to make a tight seal and turn edges up. 1. Preheat grill to highest setting. 2. When ready to cook, place the foil cartoccio(skin side down) in the center of the hot grate. Cover the grill and cook until foil pouches are dramatically puffed, approximately 7 to 9 minutes. 3. Remove the packets directly from the grill to a plate. Using a sharp knife, cut the center of the foil pouch lengthwise and open. Be careful of the hot steam. 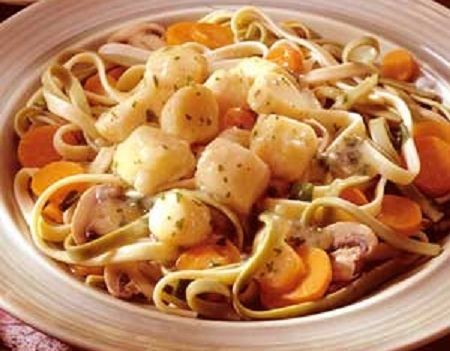 Gently poach fillets, scallops and shrimp in liquid of your choice: water, broth, white wine or a mixture of the liquids. When fish and shellfish are firm to the touch and cooked through, remove from poaching liquid and cool. Cut fillets into 1-inch chunks. 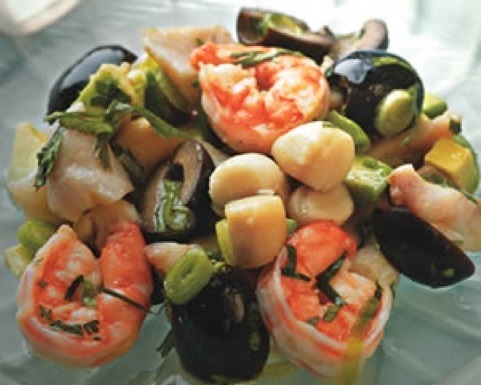 Combine fish, scallops, shrimp, celery, olives and green onions in a large mixing bowl. Season with olive oil, lime juice, parsley, salt and cayenne. So many great recipes! I love the sound of that seafood salad. Thank you Mary Frances. I hope you like the recipe. Glad this post warmed you a bit, Heidi. You will have to save this post until summer comes around to your part of the world. I appreciate your comment.